Learn--Discover the facts about PTSD and explore treatment options. Connect--Reach out and help someone (or yourself) with PTSD. By giving or receiving support, managing PTSD is much easier. Share--Spread the word and pass along what you learn. By working with others, PTSD can be battled like never before. Marine Lieutenant General Glenn Walters has been nominated by Secretary of Defense Ash Carter to serve as the next Assistant Commandant of the Marine Corps, according to an announcement made by Carter on Tuesday, June 7. 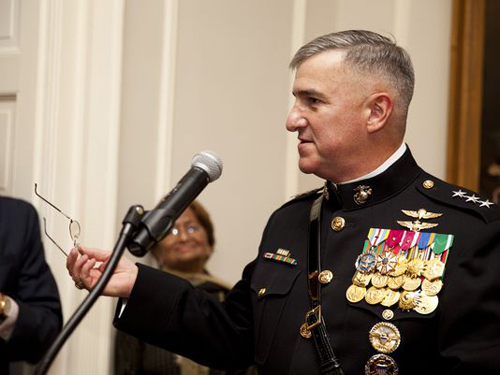 Walters currently serves as the Deputy Commandant for Marine Corps Programs and Resources. If confirmed by the Senate, Walters will replace General John Paxton Jr. as the Marine Corps' second-highest ranking officer and will become the 34th Assistant Commandant in Marine Corps history. Walters received his commission in the Marine Corps after graduating from The Citadel, a military college in South Carolina, in 1979. He was designated a naval aviator in March 1981 and has been a career Marine aviator. His awards include the Defense Superior Service Medal, the Legion of Merit, two Meritorious Service Awards and the Air Medal. *Image info: Lt. Gen. Glenn Walters, deputy commandant for Programs and Resources, has been nominated to become the next Assistant Commandant of the Marine Corps. (usMC photo by Corporal Michael Guinto). Major Generals Lewis Craparotta, Joseph Osterman, and Gary Thomas have been nominated for promotion to the rank of Lieutenant General Secretary of Defense Ash Carter said in an announcement Tuesday, June 7. Craparotta currently serves as the Commanding General of Marine Corps Air Ground Combat Center, Twentynine Palms, California. Osterman currently serves as the head of Marine Corps Forces Special Operations Command. Thomas currently serves as Commanding General of the 2nd Marine Aircraft Wing. The promotions must now be approved by the Senate. *Image info: Major Generals Joseph Osterman, left, Lewis Craparotta, center, and Gary Thomas, right, have been nominated for promotion. (USMC photos/released). The Marine Corps has recently announced that hundreds of officers will be considered for a limited number of coveted command billets this summer during two competitive screening boards. 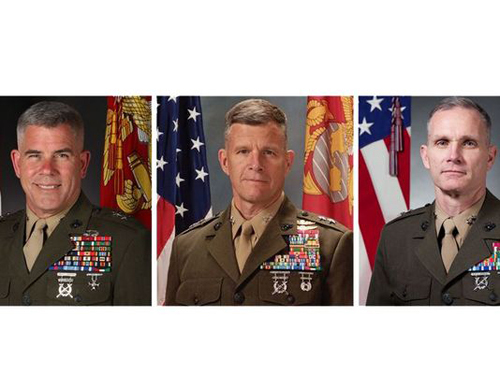 The Lieutenant Colonel board is set to take place July 7 at Marine Corps Base Quantico, Virginia while the Colonel board is set to convene the following day. According to Yvonne Carlock, a spokeswoman for Manpower and Reserve Affairs, the boards will be tasked with filling 60 command billets for Colonels and 140 for Lieutenant Colonels that will come available between June 1, 2017, and May 31, 2018. *Image info: The Marine Corps Lieutenant Colonel insignia (left) and Colonel insignia (right). 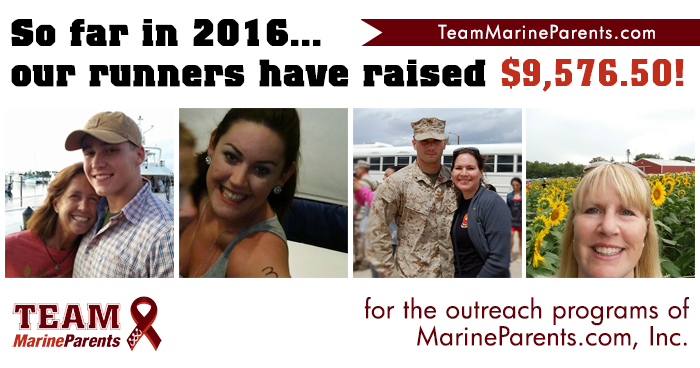 This week's featured volunteer is a proud Marine mother from Florida--Brenda Coburn. 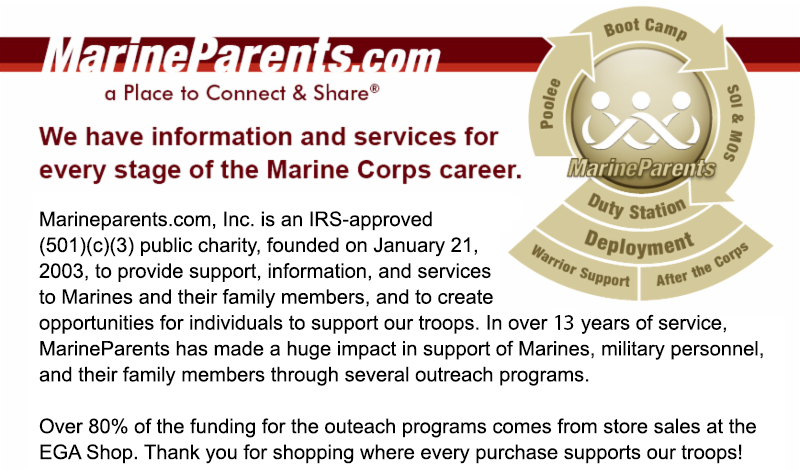 Brenda has been a Marine Parents volunteer since 2015. 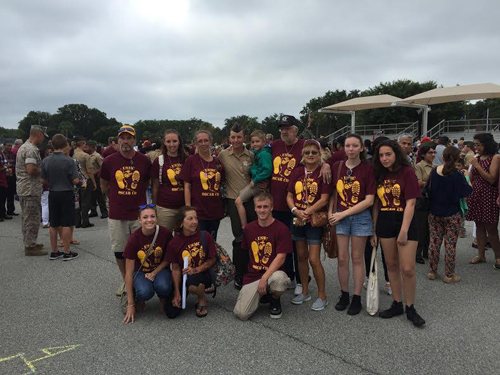 Brenda initially served as a Platoon Parent for 4th Battalion Oscar Company, Parris Island. She was promoted to 4th Battalion Papa Company Leader for Papa Company, Parris Island in August, 2015 and still serves in this capacity. Brenda has been married for nine years and has three "wonderful" daughters, including her Marine, who is currently stationed at Marine Corps Air Station New River, North Carolina and will deploying later in 2016. *Image info: Brenda (top row, third from left) and her family at her Marine daughter's graduation. 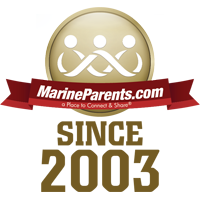 This week's TMP featured participant is a proud Marine mother from NewJersey--Lori Leskin. Lori has always been an active person, but didn't get serious about running until she was in her 40s. After blowing out her knee in 2013, Lori got serious about running after she recovered and ran her first marathon in September of 2014. 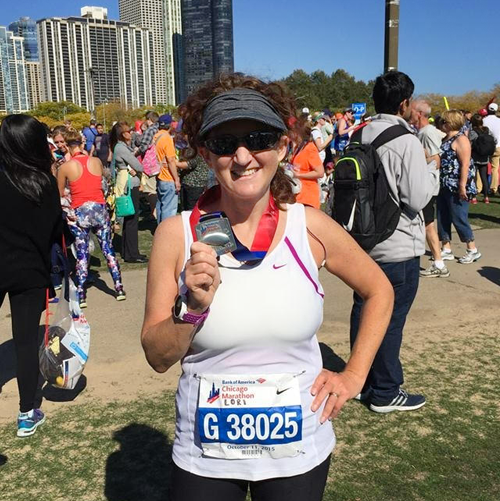 In October of 2015, Lori completed her second marathon, the Chicago Marathon. While watching the Boston Marathon earlier this year, Lori decided she wanted to run another marathon. 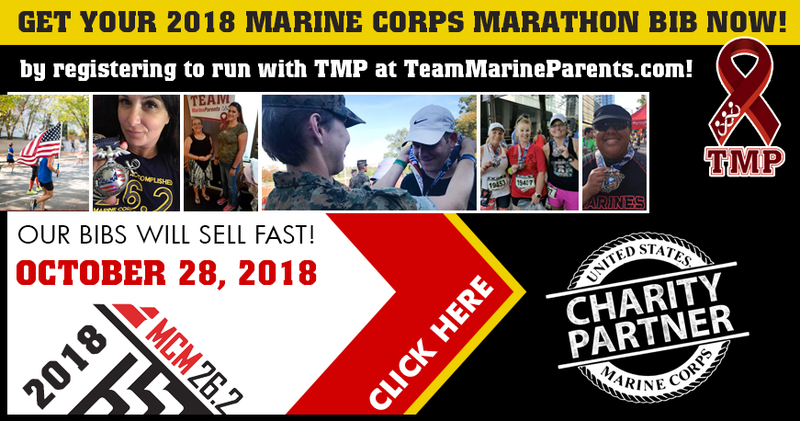 While she has no personal connection to the Marine Corps, Lori does have two close friends with sons who were in the Corps, so she decided to join Team Marine Parents and run the 2016 Marine Corps Marathon in their honor. So far, Lori has raised $195 of her $500 fundraising goal, and we know with your support she can reach her goal in no time. Thank you, Lori, for being a part of the team! Good luck in October! Twenty-one years ago this week, on June 8, 1995, a Marine recovery team from the 24th Marine Expeditionary Unit stationed on board the USS Kearsarge rescued American pilot Captain Scott O'Grady, USAF, who had been shot down over Bosnia six days earlier. 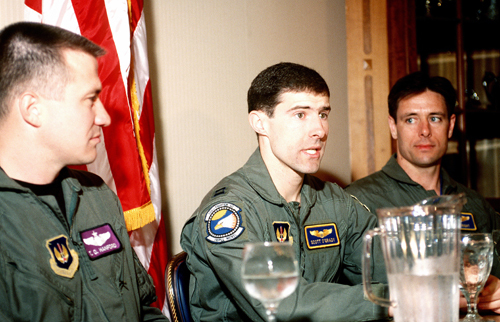 *Image info: Captains T. O. Hanford (left), Scott F. O`Grady (center), and Bob Wright (right) speak at a press conference following O'Grady's rescue after he was shot down over Bosnia in 1995 and spent six days evading enemy forces before being rescued by U.S. Marines. 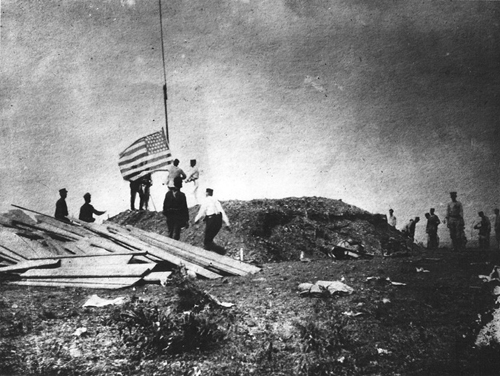 One hundred and eighteen years ago this week, on June 12,1898, t he First Marine Battalion, under the command of Lieutenant Colonel Robert Huntington, landed at Guantanamo Bay, Cuba. The next day, Lieutenant Herbert Draper raised the American flag over Camp McCalla where it flew for the next eleven days. Huntington later sent the flag to Colonel Commandant Charles Heywood informing him (Heywood) that, "[w]hen bullets were flying, ...the sight of the flag upon the midnight sky has thrilled our hearts." *Image info: The First Marine Battalion (United States), commanded by Lieutenant Colonel Robert Huntington, landed on the eastern side of Guantánamo Bay , Cuba on June 10, 1898.